Here is another Round Robin. This round robin group was called the Dogwoods. What to do for my center block this time? The longer I thought, the less time I had. Then I had an “ah-ha” moment. I had tested a star pattern for Anne Brown of Hard Star Designs, called Merlin. 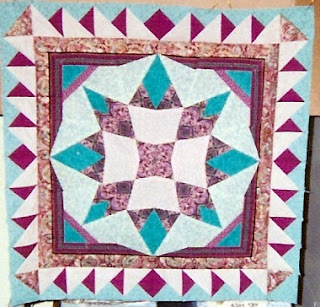 It had been challenging to piece; a lot of inset pieces and some with bias edges. I still had the block. I could use that as my starting block. Here it is. So I pack a box with extra fabric, a journal, a disposable camera, other goodies and the block and shipped it off to Carole Ann Wool in Illinois. Look at the border that she added. It complemented the block nicely. Sorry for the poor photos. They were taken some time ago with that disposable camera and no amount of editing has made them any clearer. 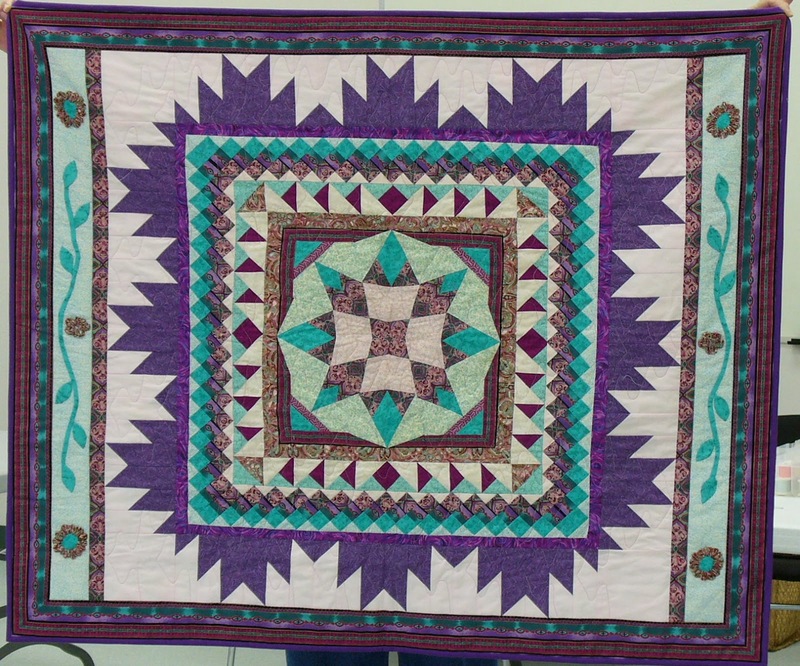 From Carole Ann it was passed on to Janet Kennedy in Maryland. 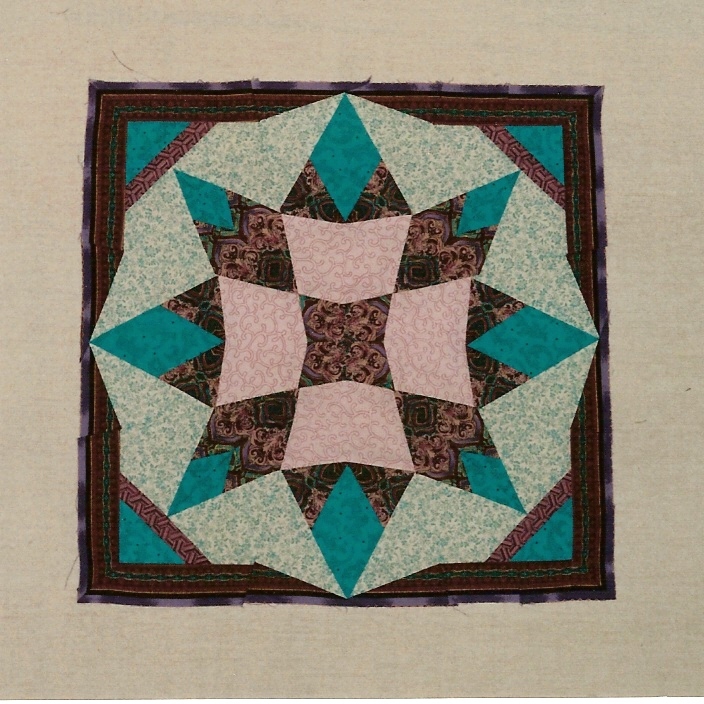 Janet wrote that she wanted to do a border with a Seminole technique. Looks like she accomplished what she set out to do. 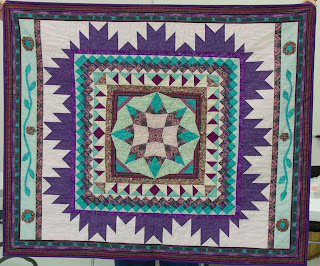 Next came the work of Trish Price in Virginia, who added a Delectable Mountains border. Interesting that she chose this border considering I live in mountainous British Columbia. I think the booklet about BC in my box might have influenced her decision. From Virginia, the top went to Jane Richter in Iowa, who put on the finishing touches, placing appliqué on two sides. I was impressed with the ruched roses in the appliqué. After the top returned to me it sat nice and cozy in its box for quite a number of years. 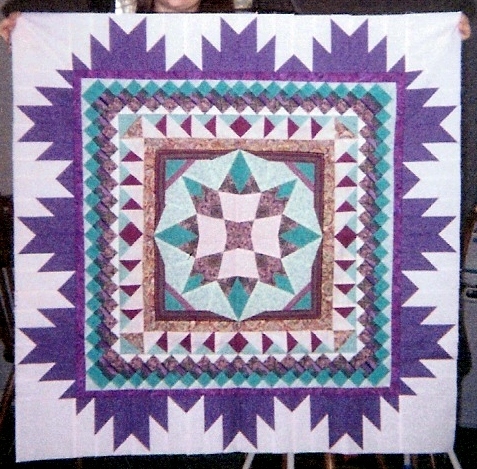 When I finally decided to finish it, it was completed in time to hang in the Blue Mountain Quilters’ Guild show in October 2008. 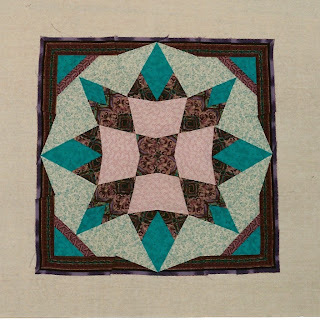 It hangs in my dining room intermittently with other quilted wall hangings as the seasons change. 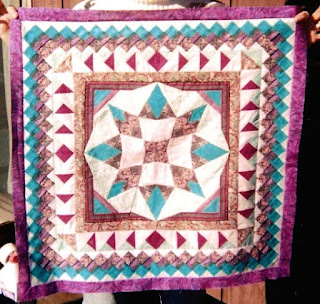 What an amazing transformation and such gorgeous fabrics!